I HATE CELLPHONES. NOT MINE JUST EVERYBODY ELSE’S CELLPHONE. The photo above is of my two favorite cellphones. The one on the left was my first ever cellphone. The one on the right, I still use. I placed tape over the brand names so nobody could accuse me of shilling for one company or another. I regard my cellphone as my emergency connection to folks I love. It’s my roadside connection when my car goes on the fritz. When I want to alert my son or my friends that I’m standing outside getting soaked by the rain, it’s my umbrella of sorts. I’ve used it during snowstorms too. Lately, I’ve been using my cellphone (one phone on the right) to take some interesting pictures whenever the urge hits me or I see something interesting in the park across the street from my building or when fierce storms rip and swirl across the Hudson River. If you’ve read my blogs or my FB business page, you’ve noticed that I’ve posted a couple of those photos. While I use the phone as my lifeline, very few people know I have one. When I apply for accounts online or in person, I never list my cellphone. I’ll list my email or my landline or my Post Office Box before I list my cellphone number. I rarely give out my cell number to friends without a conditional warning. I never answer calls on my cellphone. If they want me, they’d better call my landline when they want to talk to me. And never ever leave a message or text me. While I’ve learned how to text, I’m not good at pushing nearly invisible alphabet buttons on my phone to make complete or incomplete sentences. When I go to a store that requires me to type in my email address, I always pretend I’ve left my reading glasses at home and invite one of the salespeople to do it. That’s how much I hate using my cellphone as a typing keyboard. When I’m forced to use my cellphone as a keyboard, it takes me forever to type my email. I’m always typing in the wrong letters and numbers because of teeny tiny buttons I can barely see or read. Even if I had one of those newer cellphones with larger faces and bigger virtual keyboards, I’d still hate using it. Let me explain. I’ve been watching how cellphones started off small and have been growing. The first cellphone I had was a loaner from a good friend. 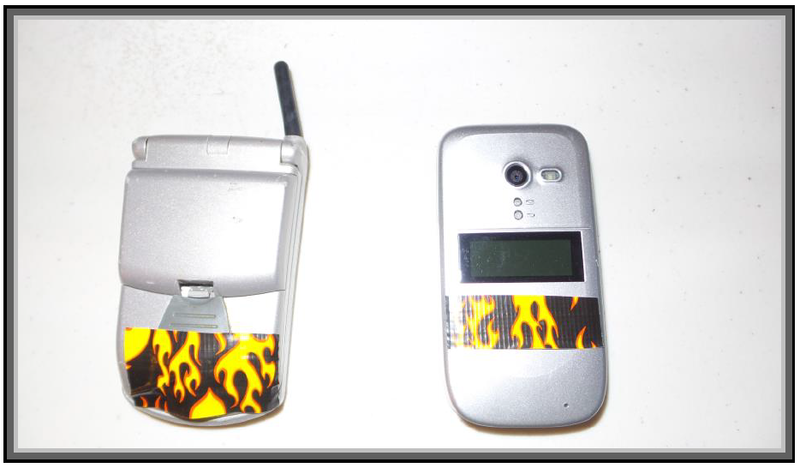 It was a square-looking Motorola clamshell that could clip onto my belt or the waistband of my pants. Back in the day, I loved the idea I could take a phone outside my home and talk to anybody I wanted. I fell in love with that doggone phone. My first cellphone fit my hand just right and it didn’t weigh that much when I clipped on my belt. It did what I thought a cellphone should do. It took calls and accepted calls, period. And that was a beautiful that having those mobile connections. My old cellphone couldn’t do many things. It couldn’t tell time. It didn’t have games to play. It didn’t have virtual maps on it to tell me where I was. Or how far away I was from the nearest gas station, bar, shopping mall, restaurant or Mama’s house. It didn’t have dating sites to see or general information, dictionaries, encyclopedias to seek. It couldn’t take pictures or make movies. It couldn’t shop for anything my little heart desired or send me alerts. It couldn’t send mail or receive mail. It couldn’t text. It couldn’t tell me what the weather was last night or if my sports team won today. My old cellphone couldn’t engage me like another human being could. My old cellphone was just a bunch of wires, chips and electronics covered in sturdy plastic with an antenna stick out that allowed me to decide if or when I wanted to do all the things it couldn’t. The newer cellphones do all the things my old cellphone couldn’t do. Why don’t I like them? I keep thinking about all the conversations with strangers that I’ve missed while standing in line at the cash register or the post office or the movie theater because everybody but me has a cellphone they are concentrating on; speaking to or playing games on. Now, I see folks walking dogs with cellphones pressed to their paying attention to more to who’s on the other end than the dog. I see mothers ignoring their babies to talk on their phones. I’ve watched people talking on their cellphones, while standing in the middle of busy streets and nearly causing accidents with their risky behavior. I guess I’m an old fuddy dud because I liked those old cellphones and what they couldn’t do.